Skin imperfections can occur from skin damage, skin sensitivity, and inherent sensitivity or may have been present since birth. They can affect confidence and due to their nature, individuals seek a skin damage repair treatment. 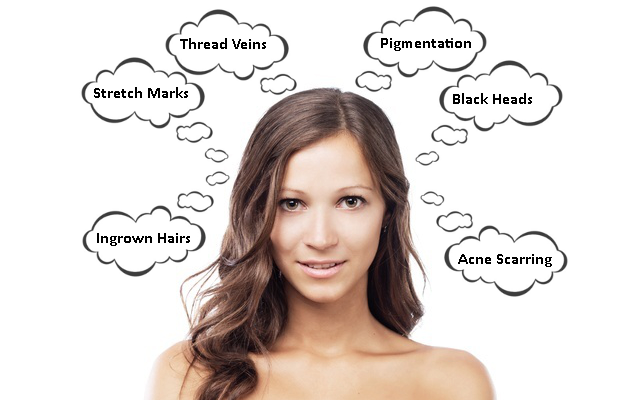 At Clear Medical we can treat thread veins (vascular lesions), rosacea, pigment marks, age spots, freckles, discolouration of the skin, scarring through spots and many other lesions. Due to our ability to tailor the treatment to your specific requirements, we can recommend a treatment or combination treatment on consultation. Thread vein (vascular lesions)/Rosacea/Campbell de Morgan spot/Port wine stain birthmark removal. Capillaries can become embedded within the skin as a result of circulatory system damage and individual inherent susceptibilities. We can remove them fully, to leave clear and healthy skin. Pigmentation Marks – Freckles/Age spots/lentigenes. These are due to environmental damage/ageing/birthmarks causing the skin to appear brown in colour. Treatments cause lightening, a reduction in size or complete removal depending on what you desire. Our treatments rejuvenate the skin by stimulating the production of collagen and elastin which increases cell turnover by 400 times the normal rate immediately after treatment. Therefore improving the appearance of the stretch marks. Treatment involves removing the skin damage and resurfacing the skin. Also, combats reoccurrence by targeting the hair that causes inflammation and discomfort. These are caused usually by an individual’s susceptibility to skin tissue/environmental particles that block a wide pore of the skin. They are also known as a comedomes. This occurs through an individual’s natural susceptibility to skin surface damage. This is due to a natural immune system response to the inflammation. Although, it does not mean that they are forever. Please select a link from above to see how we can help you. We are proud to uniquely provide skin treatment pricing per cm². This ensures that at Clear Medical our skin damage repair treatment pricing is concise, consistent and fair.